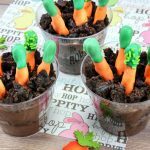 Easter Pudding Cups are a chocolatey and creamy Easter dessert full of pudding and brownies with delicious chocolate covered pretzel that looks just like a carrot patch. 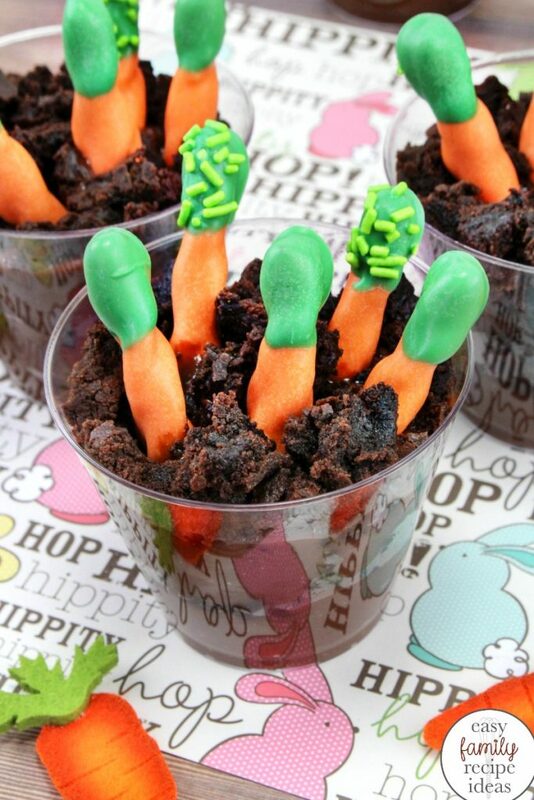 Everyone will want to eat these cute little garden inspired dirt pudding cups! 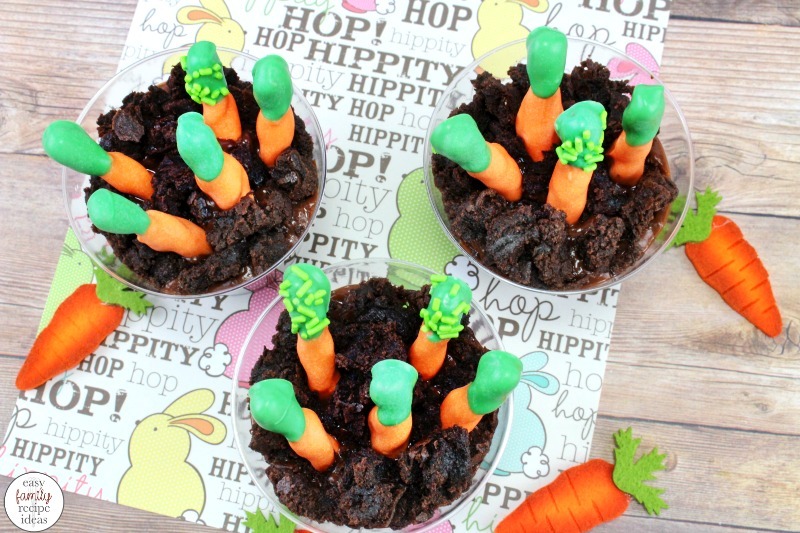 Easter Pudding Cups are so easy to make, and the kids love them! I have to say as an adult I love them just as much as the kids do. These tasty carrot patch pudding snacks are so much fun to eat! 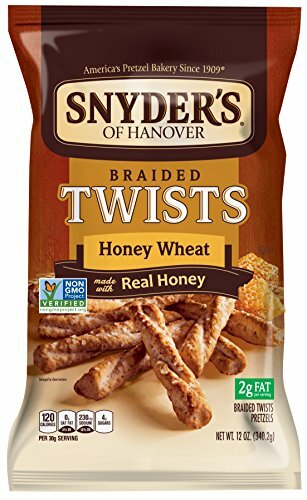 Plus, the crunch of the pretzel and smoothness of the chocolate pudding makes them the perfect treat. What you will need to make these Carrot Patch Pudding Cups is in this picture below. However, I have it displayed in a recipe list form to print out towards the bottom of the page. These Easter pudding cups only take about 15 minutes to put together and you only need a few ingredients. 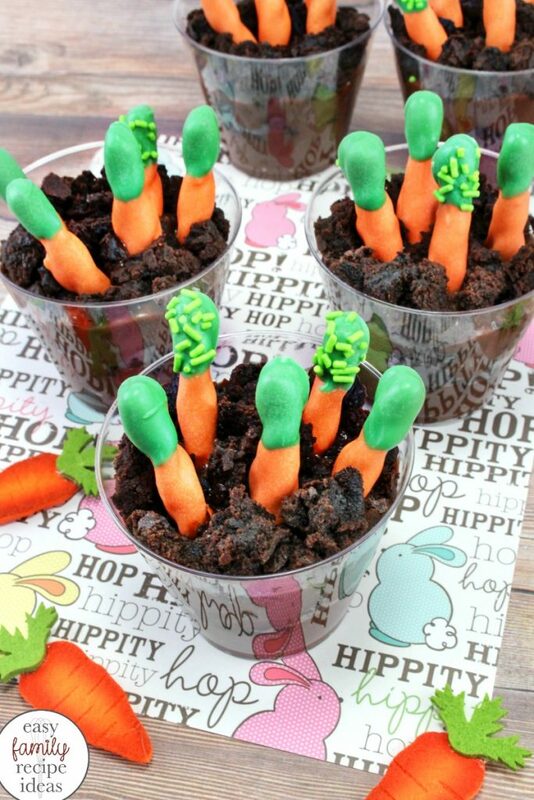 Make carrot patch pudding cups as a fun spring treat or as part of your Easter celebration. Start by melting your orange chocolate discs according to package directions. 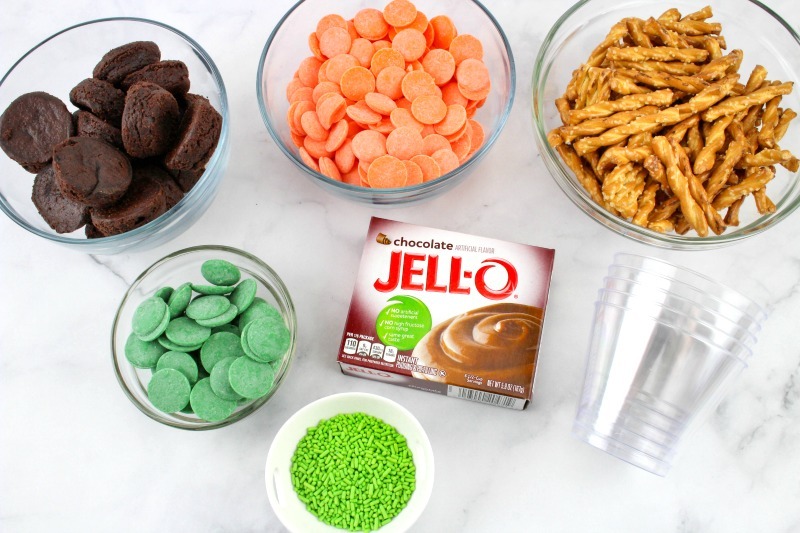 Place the melted chocolate in a deep cup or mason jar. This will allow for easier dipping. 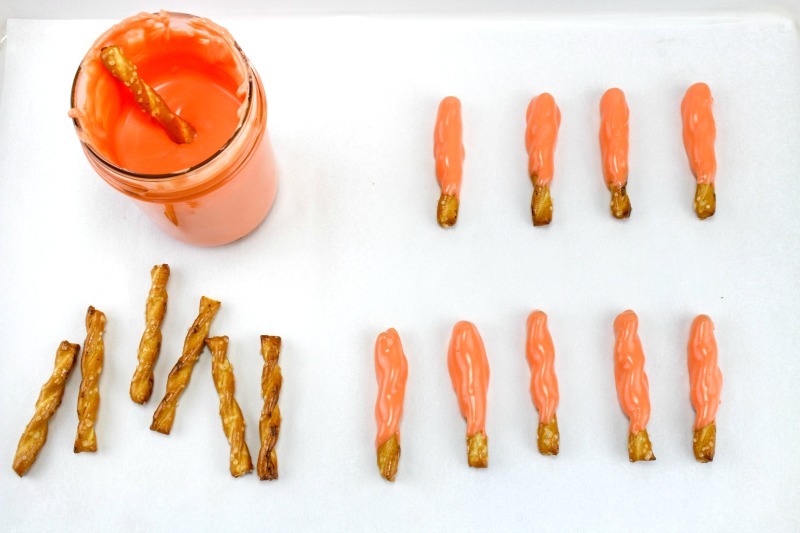 Dip each pretzel about ¾ way into the chocolate and set them on a parchment lined cookie sheet. Then let them dry. Next, melt the green chocolate discs according to the package directions. Dip the plain end of the pretzel into the melted chocolate and set them back on to the parchment paper to dry. Sprinkle a few of them with the green jimmies. This step is totally optional, but it makes them look so cute in the dirt pudding cups. Now take one cup and place about ¼ cup of pudding inside, then crumble on about two brownie bites. Add more pudding, then two more brownie bites. Stick 3-5 “Carrots” into the “dirt”. If you can’t find store bought brownie bites and don’t want to make them, you can switch out the brownies for crumbled up Oreo’s. Delicious! Serve and Enjoy for a cute Easter treat! 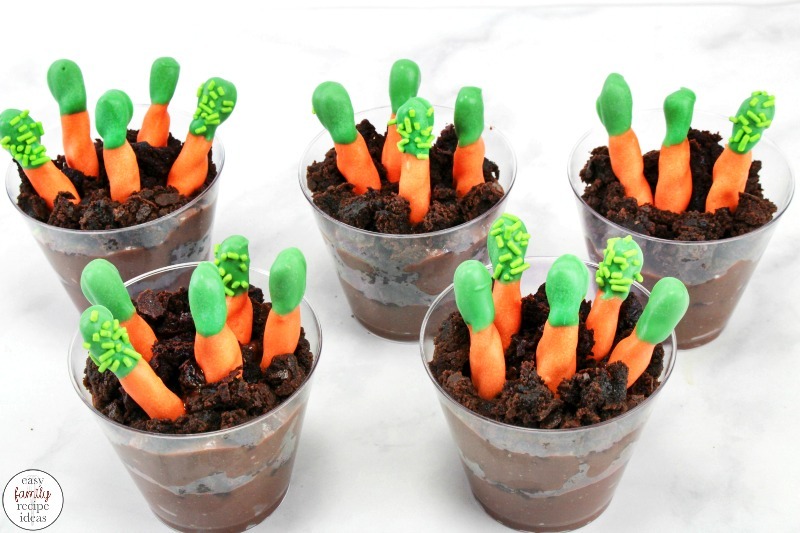 Serve these carrot patch dirt treats for a class party or spring get together with friends. Everyone will be thanking you for this yummy Easter snack. 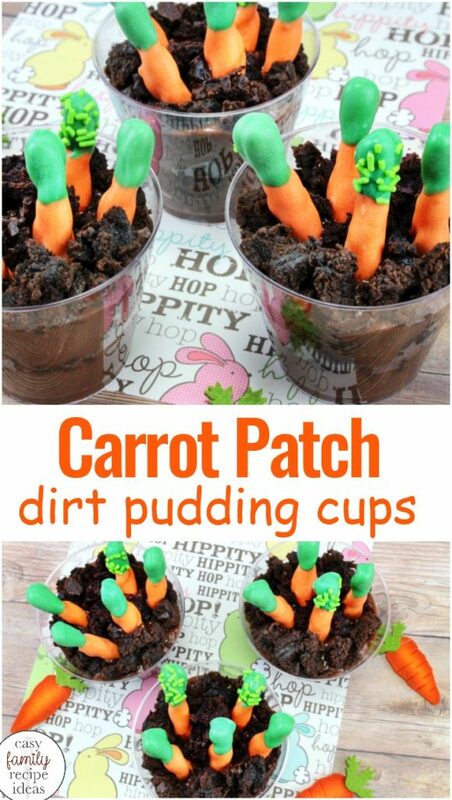 These Carrot Patch Dirt Pudding Cups look adorable and taste delicious. 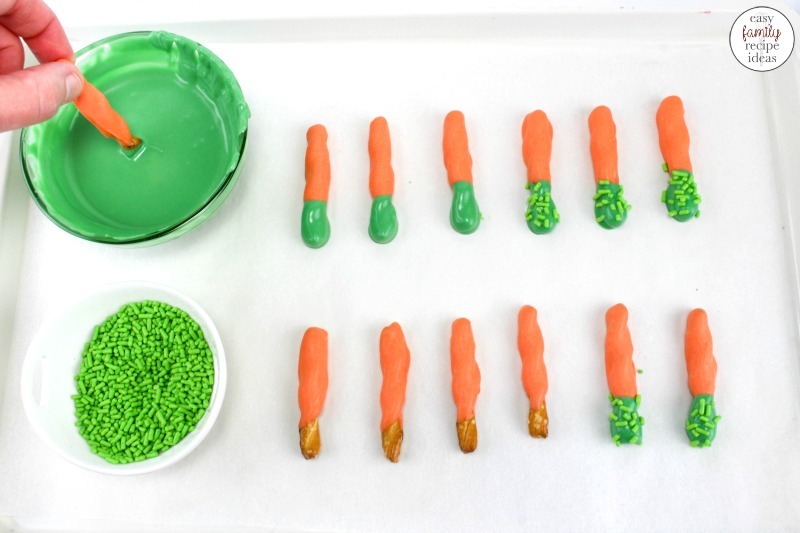 Serve them up for a fun Easter snack idea. 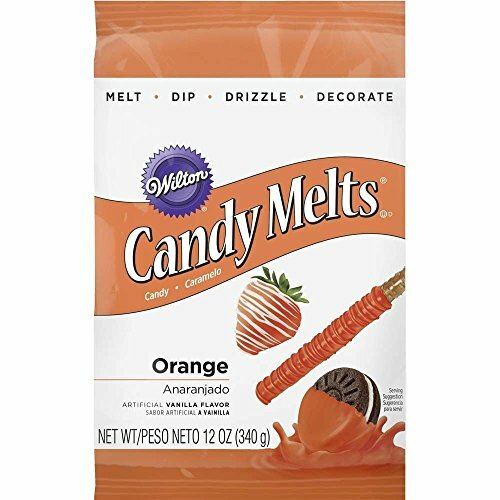 Melt orange chocolate discs according to package directions. 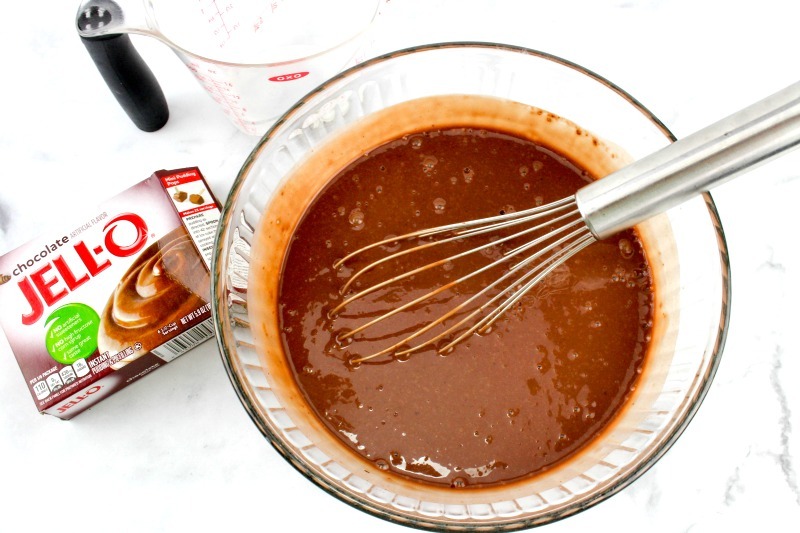 Place the melted chocolate in a deep cup or mason jar. This will allow for easier dipping. 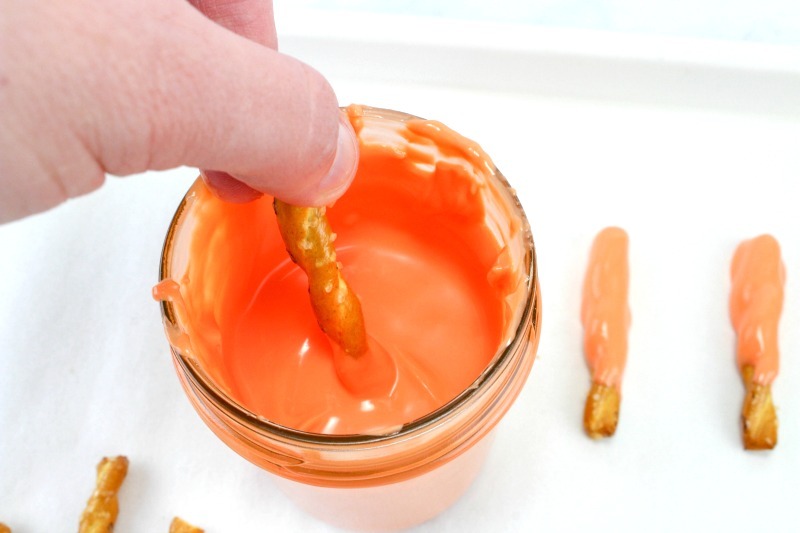 Dip each pretzel about ¾ way into the chocolate and set on a parchment lined cookie sheet. Let dry. 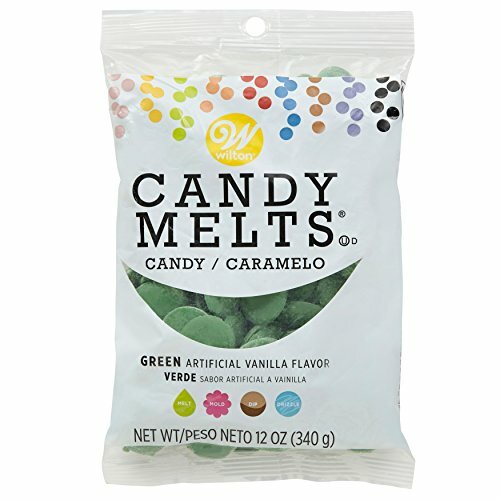 Melt the green chocolate discs according to package directions. Dip the plain end of the pretzel into the melted chocolate and set back on the parchment paper to dry. Sprinkle a few of them with the green jimmies. Now take one cup and place about ¼ cup of pudding inside, then crumble on about two brownie bites. Add more pudding, then two more brownie bites. 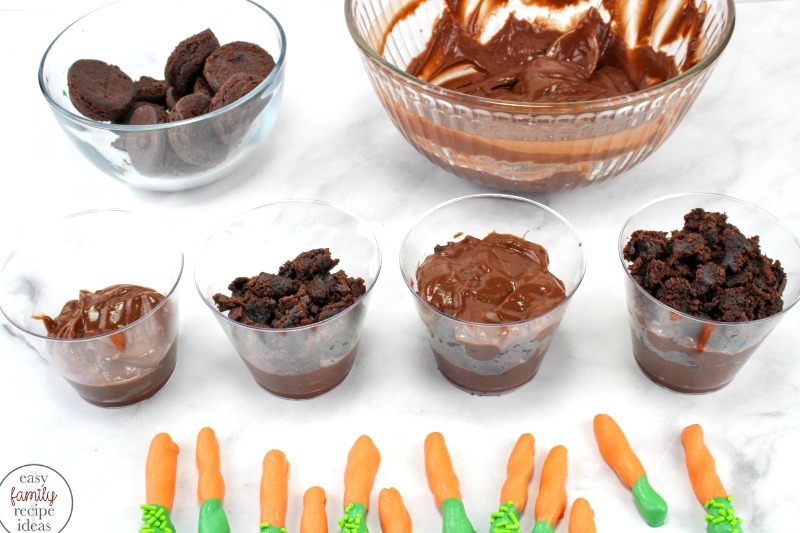 Stick 3-5 “Carrots” into the “dirt”.If you can’t find store-bought brownie bites and don’t want to make them, you can switch out the brownies for crumbled up Oreo’s.